In this post: I discuss the begat list in chapter five and how it helps put a date on things from here out, then we get started on the story of Noah’s flood. The key part of this chapter is the meticulous and detailed timeline it gives us. By taking the number of years a person lived before begating the son named, then adding the numbers of years that the son lived before his son was born, and so on, we get a dating system of sorts which I’ll call After Creation or AC. For example: 5:3 says that Adam was 130 yrs old when his son Seth was born. Then, in 5:6, we learn that Seth was 105 when his son Enos was born. So by adding 130 to 105 we can say that Enos was born 235 years after creation was finished, or 235 AC. This dating system gets more detailed and starts to come in really handy in Chapters 7-8. If we revisit some creationists claims that the ‘days’ of creation could have been eras or millennia, or whatever, we find that not only is this soundly refuted by Genesis 1:14, but by Genesis 5:3-5 when it uses the word years for how long Adam lived, which by the way was a total of 930. Not bad for someone who was supposed to die the day he ate the forbidden fruit at least 800 years earlier (he lived 800 years after Seth was born. Seth was born after Cain killed Abel. Cain killed Abel after his parents had been evicted from Eden. See how useful detailed begat-lists can be). As I mentioned before, the only discernable reason for this chapter is introducing Noah. With a little basic math and Gen 5:28-29 we learn that Noah was born 1056 AC. Then we learn at the end of the chapter that Noah is five hundred years old and has three sons. So the date is 1556 AC. Genesis 6:5-6 tells us God noticed that mankind had become utterly and completely evil, and that God regretted ever creating them and was sad about it. And, who can blame him for being sad. He created people twice and they still had design flaws, I would be upset with myself too. So, God decides to rectify his mistake, by destroying not only people, but every other animal on the planet. (Gen 6:7) Well, not every animal, because fish and other aqutic life are not mentioned on the to-destroy list, which is understandable, after all, who doesn’t like dolphins. God looks at the Earth again and sees that nothing has changed since the last time he looked. (Gen 6:11-12) Measure twice cut once. You would think that an all-knowing god wouldn’t have to double-check himself, but there you have it. After double-checking himself, God tells Noah that he plans to destroy everything (Gen 6:13) and then goes into great detail about the boat he wants Noah to build. It will be 300 cubits long, 50 cubits wide, and 30 cubits high. (Gen 6:15) A cubit is 18 inches, so the measurements come out to 450 ft long, 75 feet wide, and 45 feet tall. A large boat, but by comparison the Queen Elisabeth 2 is 1,132 feet long, 135 feet wide at the waterline, and 236 feet tall, and an American pro football field is 360 ft long and 160 feet wide. God then explains to Noah that he intends to cause a flood so great that “ every thing that is in the earth shall die.” (Gen 6:17) This possibly means that he changed his mind about killing dolphins. 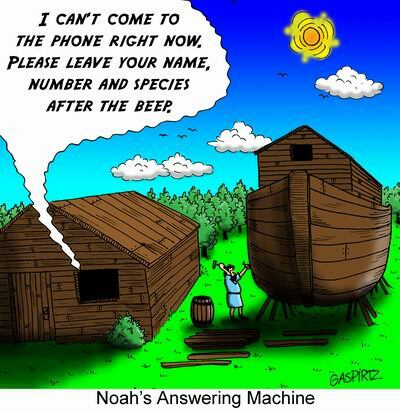 After shocking Noah with that news, God goes on to say that he will strike a deal with Noah wherein he and his family will be spared in return for building the big boat, and putting two of every living land animal, insect/invertebrate, and bird on the planet along with enough food to feed them all on his boat. (Gen 6:18-21) God also tells Noah that the animals will come to him, which is a good thing since there’s no way that Noah could have gotten to Patagonia and back in time, much less Australia, or Antarctica. Noah agrees to God’s deal and gets started building his big boat in the desert. (Gen 6:22) Actually, I can’t say for sure that Noah was in the desert, for all we know he lived in Madagascar, but since every other time the Bible talks about the World, it is centered on the Middle East, I’m assuming that this story takes place there as well. It’s as though the authors are completely unaware that places like North and South America, Australia, Antarctica, or the Arctic even exist. We are never told why God, who had the power to create, and then re-create everything didn’t just blink everybody on the planet except for the Noah clan out of existence thereby taking care of the whole evil babies problem, while leaving the animals and plants unharmed. This seems to be a better plan than destrying every single plant and tree on the planet with a flood. I guess it’s possible that God was a little sadistic and thought it might be fun to watch babies drown. It’s, also entirely possible that God did it out of spite, we’ve seen him be spiteful before with the whole Garden of Eden eviction. And, it’s possible that he did it because the Sumarian gods had done the exact same thing centuries before the Bible was written. We know how prideful God can be, so letting some Sumarian god out-destroy him would be unthinkable. Or, Maybe God just enjoys a good Russel Crowe movie, and was thinking ahead. I guess we’ll never know. On the Next episode of The Bible for Atheists: God’s first genocide. It should be fun, so stay tuned. This entry was posted in Genesis and tagged Adam, Angels and Women, Bible, Bible Passages, Bible Study, Book of Genesis, Books of the Bible, Enos, God, Horny Angels, Human Lifespan, Jeanne Calmet, Methuselah, Mythology, Noah, Noah's Animals, Noahs Ark, Powerful French Women, Seth, Unintellegent Design on December 1, 2013 by Atheist Ron.